Last summer I made an arrogant attempt at olive oil ice cream. I thought I could get away with the inexpensive peppery flavored olive oil I had on hand. Well, the result was less than pleasing. I didn't mind it, but you could put olive oil on a chocolate cake and I would find it delicious. I've ingested so much olive oil in my Italian-American lifetime that I'm certain that if you put an IV in me you could make vinaigrette with my blood. My blood might actually be vinaigrette! Well, I was in New Jersey visiting my sister and I finally checked out the olive oil and balsamic vinegar store that she has been raving about: Patricia & Paul Artisans of Fine Oils & Balsamics. I bought some fruity, and blood orange infused olive oil. It was perfect for this ice cream. Olive oil ice cream has a smooth almost gelato like texture to it. It is less sweet and more adult in taste than regular ice cream (of course my 11 year old loved it) so it might go over well with your whole family. I definitely recommend experimenting with different fruit infused oils. Since my daughter's swim competitions are over I have my pastry chef back. 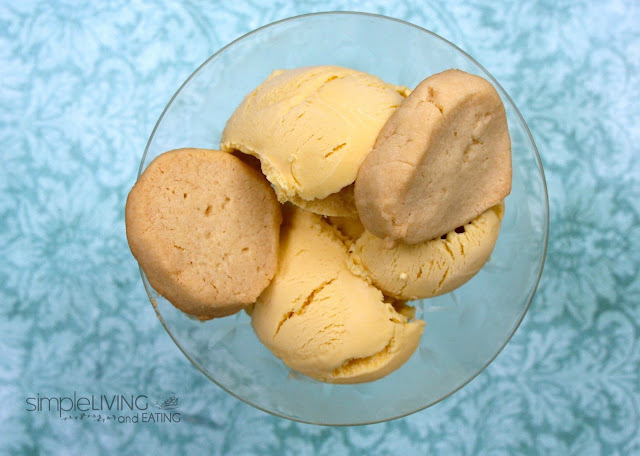 She made both the ice cream and the salty and satisfying Sable Breton Cookies to go with the ice cream. The combination is extra special. I'm trying to find mild olive-oil, but no luck yet. It is really great... very adult tasting, rich not as sweet. I've made olive oil cake before too. It has a very rustic old world flavor and texture. Tell me about it... the first batch was pretty funky. Oh yes, I had it on green salad and a carrot salad...delicious. Diane, this sounds amazing! I had a bad experience making Brazilian cheese bread with some overly fruity olive oil and man, did that go wrong :) This ice cream sounds like it makes the best of a smooth, light olive oil. Need to bust out my ice cream maker! If you like olive oil infused cooking you may really enjoy this own... I found it to be the most different ice cream I've ever tasted.